Discussion in 'Textures & Models' started by Emotione11, Aug 29, 2017. There is only so much you can do about that _Simbaa. If you consider the images in this article you will notice that we're in a bit of conundrum, since arrowslits are actually assymetrical: narrow towards the outside and wide towards the inside. We don't have the luxury to make blocks with that behaviour, at least not with the current coding manpower. So what we have in the world represents a compromise between this asymmetry and usability. I am not sure if you've tried shooting an arrow through our current arrow slits, but it's hard enough as it is. I agree however, that if we could find a block-centric solution to the issue I'd be in favour of having them changed to a more realistic depiction. I am bothered beyond belief by the fact that our arrowslits allow to look through them sideways when they are integrated in a row for example of 3 right next to each other. That always breaks my immersion. I understand your concern but why not do it in the similar fashion of the ornate brick arrow slit? That one is slimmer that the stone window one and the slab arrow slit? Do you mean the Stone Slab Arrow Slit? The lighter version of the Stone Brick Window? I personally think that doesn't clash too badly with Light Reach Stone / Light Stone; if anything; I think the slight contrast / texture difference adds some spicy variation. I think that's the one yeah. It's the arrow slit used a lot in WH. I've tried to use it with my reach tests and it's coming out looking a bit weird. I just enjoy the shape of those arrow slits. The single block reach arrow slits are really tiny and don't make nice 'small windows' in the same way the others do. Perhaps if the arrow slit was added to 'Reach Pink Brick' (2071:8) it would be super useful. I would like to report a few bugs regarding block textures not changing when placed in certain biome types. Also, in the Deep Ocean biome, the Red Sandstone Stairs block does not seem to change to it's new texture. It reverts back to the old version which is half red and half beige colored. I'm in the process of applying for a project which is placed in a Deep Ocean biome, so the issue of the blocks not changing to their darker variant is a problem for me at the moment. If this could be fixed, I would be very appreciative. Thanks! could we rename "peas" aka netherwart to "pease" i know it's a little weird, but, it is the way they are called in the books plus, who would eat pea's porridge when you can have pease porridge!? Really? It doesn't do that for me I want irradiated pease! I noticed earlier that the tool blocks (wedged pickaxes, axes etc) were way to fancy. What sort of medieval miner wraps their pickaxe handle in red silk and then decorates it with gold? On the other end of the spectrum, the axe and shovel look a bit too makeshift; medieval tools would not normally have been held together by rope, more of a bronze/iron age sort of thing. I've made some new textures for these blocks which should better tie in with our "simple and realistic" theme on the server. Enah, EStoop, mdmeaux and 1 other person like this. I would like to propose a new block for the pink walls of maidenpool, as the Reach "pink" is now yellowy/grey. Wazgamer and Enah like this. Kedanox, PoziPoisonDart and Enah like this. Kedanox and Cedo like this. Dragonbone is black, right? The valyrian stone block being added for the Hightower (canon) should suffice for that also. Just need to add stairs etc. Speaking of which, @Thamus_Knoward are you still interested in working on the valyrian stone block? I'll give that another go tonight! Oh but make sure to chuck in the pebble/shingle beach textures! Emotione11 and Wazgamer like this. Now available in the dropbox You should probs include stairs/slabs/etc. I can make blocks that look erroded for now I just made the pristine fused stone with CTM! First with regard to that black stone texture: If you wanna do a gradient with obsidian, could you update that texture a bit? So it looks more like a processed stone/or a bit more subtle. I always thought it looked a bit off / vanilla-y. You could use it to show erosion on the dark stone. Seawind or so, on the base of the Hightower, for instance. 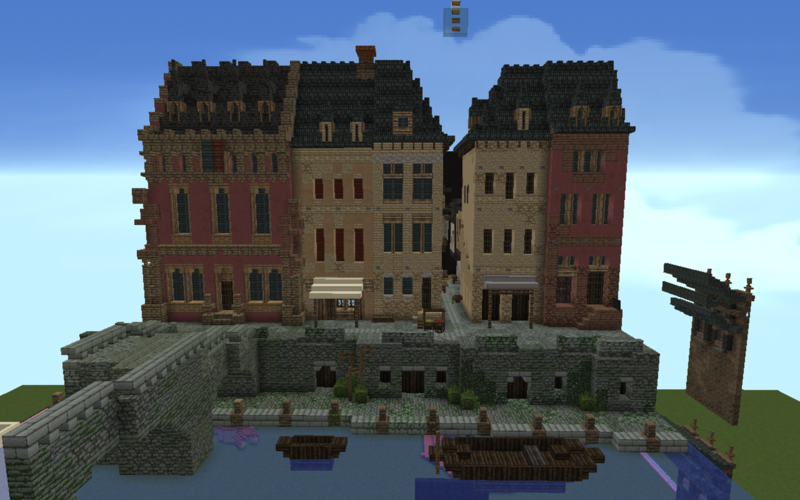 Second, is regarding Oldtown blocks: I love how they look, gj boys! Really enjoying working with em so far. I have one request though. Can we get a "window block" for Oldtown? It would behave the same as the terracotta arrow slit, only with a rounded top, with the new OT texture on it. (brick would also be cool. It would really make Style II more recognisable with the perfect semicircle and brick framing). Right now we have the terracotta arrow slits, which really have too distinct a shape to be used broadly in Oldtown (ideally they wouldn't at all be used, really), and the small window block. That last one works wonderfully for little 1 block windows, but for 2 block tall windows it doesn't work too well, as it does resemble an arrow slit more than a window. Also, I've been trying to get window framing to look good, a feature you'll see on pretty much every inspirational picture in Stoops' collection, and I believe this would help immensely. Arkilstorm, CashBanks, nubcaker and 1 other person like this. Maybe also lighten the new block also to be a bit closer to obsidian rather than pure black? Perhaps it's my f.lux settings but I'm struggling to see any of the details in the texture, it just seems pitch black to me. The screenshot turned out awfully dark, in game you should be able to see details and a small 1 pixel wide relief around the edges. Let me know when you've seen it in game and still feel the same way about it. I came up with some feedback on the OT textures: I really like the yellow plaster and the other OT blocks, they all blend really well together. The umber one is my main concern in this post. I guess it all depends on whether we want OT to have a lighter or darker tone. I'd argue for lighter in the case, because in terms of luminosity of the textures alone the umber by far stands out as the darkest. Lightening the texture a bit could help bridge that gap. Kedanox, EStoop, TheYoungWolf and 3 others like this. @Emotione11 Hey man, Howy and I were inspecting the new plaster blocks and realized why it felt out of place to us. Compared to all the other plasters they are the smoothest blocks we have in our entire palette. I like the cuts and irregularities you've added, but if its OK with you I'l like to try to make a base texture that's more in line with the other plasters we use. I have no problems with using the dun blocks, they really combine well with the pink reach and oldtown blocks. Regular orange clay bricks definitely stand out too much. Also, I'd like to give a shoutout too all builders involved with testing for Oldtown to think of ornate blocks of various levels of simplicity/intricateness, to be able to add a little desired uniqueness to some buildings. k, wolf and I came up with some feedback on the primary new OT bricks, those on the prismarine and end stone textures. They're too saturated and yellow to us. Desaturating them a bit and raising the contrast in luminosity (which I couldn't do in lightroom), might help. I think it might be helpful if someone could like post a couple different versions of the texture so we can compare. Edit: Come to think of it, one could use the reach terrainset blocks as a guide for which color to aim for. They're a nice pale yellow/orange. With a bit more contrast to signify use, that color scheme could work I think. You were not very careful with your comparison as it seems you have also bleached blocks that are not part of the dedicated OT palette. Such a change will be quite impossible without affecting already completed builds.